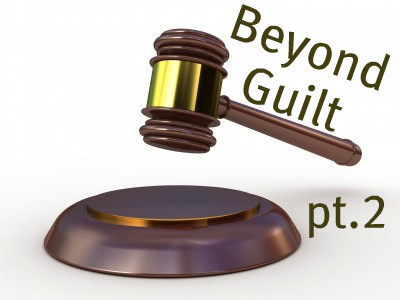 This week I am pondering how to preach with a more nuanced approach than mere guilt pressure. As I’ve written already, there is a place for genuine conviction of sin, and I am not hiding from that. But equally, I am not just hiding in that, nor avoiding the danger hiding in a non-nuanced guilt approach. How can we hide in a guilt approach? I suspect some see no other way to help lives change than to pile on the pressure. Every passage is turned into a guilt trip. Doesn’t matter what tone the passage takes, the message will have been filtered into a guilt and pressure tone. And what danger is hiding in such an approach? There is an implicit danger with guilt focused messages. I say you should feel guilty. If I convince you, then you feel that you must change. Guilt alone will not drive people to God. It will drive them to despair or to efforts of the flesh. Neither result is good. Guilt has to come in a package with hope, with grace, with access to life transformation that has to come from God, not from self. So, yesterday we looked at the issue of stance. Here’s another element, perhaps an obvious one, but still important nonetheless. 2. The Preacher’s Tone. Too many people think too simplistically. As if communication is about information transfer. But the truth is that communication involves a complex of signals, some of which can override others. So my body language can contradict, and overwhelm my words. So too can my vocal presentation. Voice and body language combine in regards to the tone of my communication. If my tone is close to that of an angry prophet, that will override the most gracious of poetic content. If my tone is akin to that of a Victorian school master, then my words, my message, will take on a whole new meaning. Children know this. If a parent says their name with a certain tone, they know they’re supposed to feel guilty. It’s voice, expression, posture, etc. But it boils down to tone. Do you have a default tone that is guilt inducing? Can you make the most encouraging passage into a pressure text? Can you turn Psalm 23 into a rebuke for not being a good sheep? Can you take Jesus’ yoke and burden, which are easy and light, and make them tricky to put on properly if your listeners aren’t living just right? Let’s be sure that when we preach, it is not just our words that reflect the meaning of the text, but that our tone also reflects the tone of the text, and the tone of the God who is speaking to these people on this occasion. Stance and tone can be adjusted to avoid a guilt-only approach. They can be factors in a better motivational methodology. But tomorrow we’ll zero in on a key factor in preaching to encourage and motivate.